Cartamundi Eagle Playing Cards – Great Value! Cartamundi Eagle Playing are one of the best value-priced playing cards on the market today. Eagle Playing Cards feature a unique pattern back with eagle heads in the four corners of the card backs. 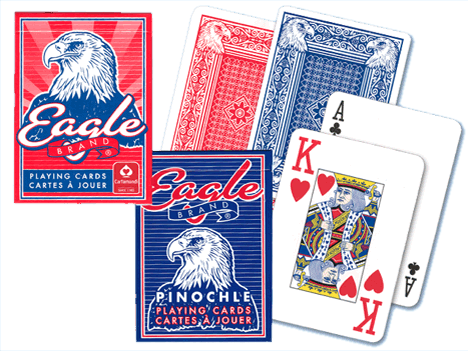 Eagle Playing Cards are available in poker size, with regular or super index numbers and pips. For more information or volume pricing on Cartamundi Eagle Decks, please contact us at 1-800-233-0828.